I totally love this luxe fall look! I think this Kate Spade sweater is baggy enough that if I order up a size or two that it will look cute even though I am pregnant and then just look like an over sized boyfriend sweater for next season. I totally adore the print and color scheme of this sweater! I have wanted the Rage & Bone booties for years and trying to decide whether it is time to take the plunge. I like that they have a stacked heel that will be easier to maneuver around in while pregnant. I don’t foresee myself wearing heels very often without a stacked heel this fall and winter. 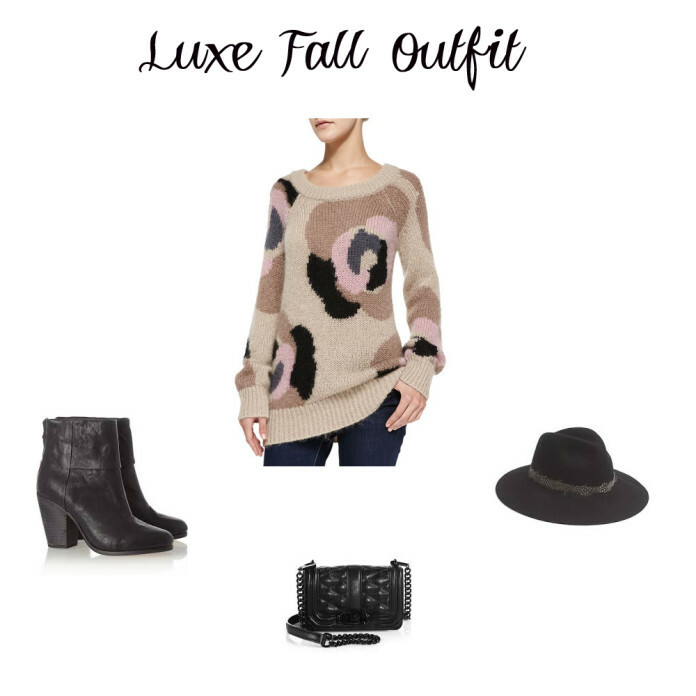 I will be completing this outfit with skinny maternity jeans or maternity leggings depending on how the sweater would fall. I decided to add simple accessories to complete the look since the sweater is the shining star of this outfit. I have to be honest, I am struggling a bit with putting together my new pregnancy wardrobe. My waist has always been the smallest part of my body, so this is a totally new way of dressing for me. I want to be comfortable, but not frumpy and would like to make as many pieces that I buy transition afterward if possible. I thought this sweater would make a good splurge item since it was so cute and also looked incredibly comfortable. Agh, the sacrifices that we make while pregnant!